American singer and songwriter Jerry Lee Lewis successfully established himself as one of the best music makers of all time during his heydays. When it comes to rock n roll, rockability, country, blues, honky-tonk, Lewis had it all and has left an indelible mark through his many achievements in the competitive entertainment industry. Lewis is also an instrumentalist known for his skills with the piano. His career has been quite a journey filled with stories of high’s and low’s. Here is everything you need to know about the veteran musician. He was born on September 29, 1935, in Ferriday, Concordia Parish in Louisana, to his parents Elmo and Mamie Lewis. Lewis, always inclined to music, started playing the piano when he was very young. His love and dedication to the musical instrument pushed his poor parents to mortgage their farm to buy him one. But they wanted him to use that talent of his in the church. He was enrolled in the Southwest Bible Institute where he would later be expelled for violating school rules by playing worldly music. His expulsion from school pushed him to play at clubs in his country home. In 1954 Lewis released his first demo recording and continued to play in clubs. After a successful audition with Sun Records in 1956, he started recording as a solo artist for several Sun artists. During this time, he released several singles and hits including Whole Lotta Shakin’ Goin’ On, Great Balls of Fire, and many others which boosted his solo career. He became very popular at the time especially for his distinctive piano stunts on stage. However, Lewis’ rosy path to success soon turned thorny in 1958 when it was revealed that his third wife, Myra Gale Brown was his 13-year-old first cousin. The musician who was 22 at the time was greeted with truckloads of criticisms from stakeholders and the entire public. The uproar was so overwhelming that his tour that year was canceled after 3 concerts. It didn’t stop there, Lewis marriage scandal took a toll on his career costing him loyal supporters. The pianist went from $10,000 per night for his concerts to $250 and at small clubs. His contract with Sun records ended in 1963 and he moved to Smash records where he released a lot of songs that failed commercially. But towards the end of his contract with Smash, Lewis bought an idea pitched to him by Eddie Kilroy to record a song in Nashville. He subsequently released the Jerry Chestnut song Another Place Another Time which surprisingly topped the country charts and brought him back on the big platform. He was inducted into the Rock and Roll Hall of Fame in 1979. Lewis still performs in concerts and continues to garner more recognition in the industry. Jerry Lee Lewis’ net worth in recent times has been estimated at $15 million. Even though he has not released new records, he still makes a lot of money from his hit tracks from his vibrant days. The pianist also earns through performances at concerts. News of Lewis’ scandalous marriage to his cousin Myra Gale Brown was received with so much disgust by stakeholders in the industry in the 50s. Traces had revealed that Myra was his first cousin whom he shared the same lineage with from a grandparent. In 1989, a biographical film, “Great Balls” of Fire was released and was based on a book written by Lewis’ cousin ex-wife Myra Gale on his early life in rock n roll. Lewis lent and re-recorded his songs for the soundtrack of the movie. The movie told the story of the artist’s relationship with Myra including the marriage scandal which took a toll on his career in the 50s. Lee Lewis has been married seven times and had six children from his marriages. He was first married to Dorothy Barton in 1952. It, however, lasted only 20 months as the couple split. His second marriage was to Jane Mitchum and it lasted for four years. 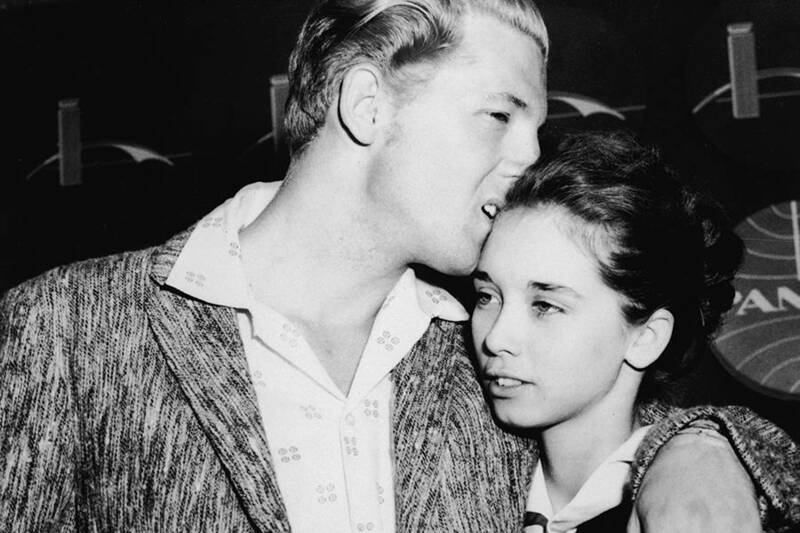 The couple had two children; Jerry Lee Lewis Jr. born in 1954, and Ronnie Guy Lewis born in 1956. 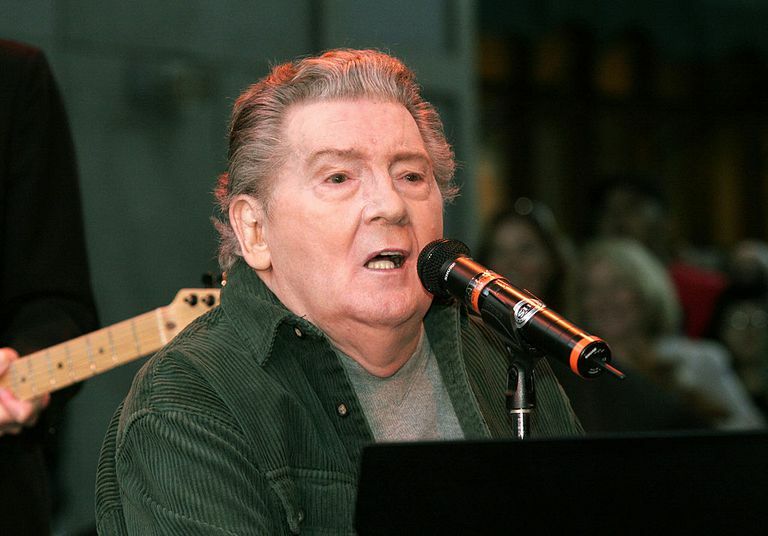 Jerry Lee Lewis Jr. lost his life in a car accident in 1973. See Also: Who Is Hans Zimmer, What Is His Net Worth, How Much Does He Make Yearly? Lewis’ third marriage to his cousin Myra Gale lasted for 13 years. He had two children with her; Steve Allen Lewis who died in 1962 in a swimming pool accident, and Phoebe Allen Lewis born in 1963. Lewis married the fourth time in 1971 to Jaren Elizabeth Pate and had a daughter, Lori Lee Lewis with her. The marriage ended in 1982 and in the following year, Lewis got married to his fifth wife Shawn Stephens who died 77 days after. His sixth marriage was to Kerrie McCarver in 1984. The marriage came to an end in 2005 after 21 years. They had a child together, Jerry Lee Lewis III born in 1987. Lewis got married the seventh time in 2012 to Judith Brown. Jerry Lewis is very much alive and still performs in concerts. This is contrary to reports that the rockability singer is dead. Death reports about the singer emerged after it was reported that comedian Jerry Lewis had lost his life. Due to the similarity of their names and the fact that they were both counterparts in the industry, many mistook the comic legend to be Lewis the singer. But Lee Lewis is still alive and well.